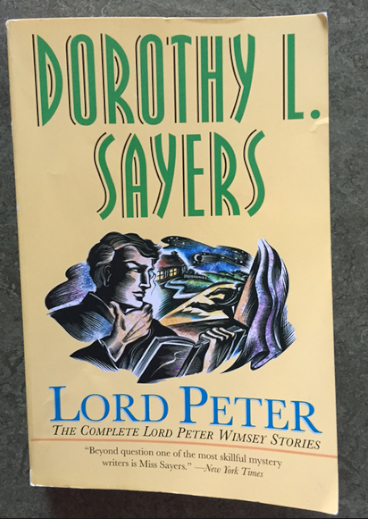 I’m now re-reading all of the more obscure Dorothy Sayers books, delving into the corners of Lord Peter Wimsey’s existence that I wrote about earlier this month. There are twenty-one stories here collected—which seem to not be all of them, despite the “complete” of the title—and include two dated after Sayers stopped writing the novels. One takes place on the birth of Peter and Harriet’s first child, and the last, “Talboys,” is set in a happy future where the couple has three sons and the mystery involves not a corpse but Mr. Puffet’s stolen peaches. The story was not published in Sayers’ lifetime, and seems to have first appeared in 1972. I’ve read that Sayers is credited with establishing literature’s first instance of a serial detective with an inner life, and the stories provide a good sense of Peter’s arc, from the earlier more theatrical work to the ravishing last two, where the authorial voice is more intimate. Wimsey’s early cases are ghoulish, chilling, humorous and erudite, with a splash of 30s glamour and medical oddity. A lovely book. Ah, Lord Peter Wimsey! I’ve always loved his novels and stories too, though I think I may have missed one novel at least way back when, when I was trying to follow his inner life in a chronological line through to “Busman’s Holiday,” or “Busman’s Honeymoon,” or whatever the title was. I did read the complete tales, and loved the story about the peaches, though some people (and I mean some soi disant critics of the detective form) objected to the introduction of a permanent female character in his life, and said that Dorothy Sayers was using her great detective as an instance of romantic wish fulfillment because he was good to Harriet sexually after her tawdry affair with I think an artist who used her badly, and because he married and settled down. I wonder, then, what they made of Agatha Christie’s Tommy and Tuppence, another married couple. I suppose they were “all right” because they were chatty and witty and modeled on the Nick and Nora model, and therefore not prone to be romantic and outwardly loving with each other! Another thing I really liked about Dorothy Sayers was that she was a talented academic writer when the notion suited her. I think I read her introduction to “The Song of Roland,” possibly (?) or something like that, though again she had her decryers amongst the academic community, who apparently resented her poaching on their turf. I mean to say, how dare she be a mystery writer with the ability to write serious criticism and scholarship! Anyway, I enjoyed your post. What!? Who are these evil critics? (I don’t really want to know). I love Dorothy Sayers with witless passion and will never hear a word against her. Not nearly enough people read her nowadays, so I’m so glad you do.